How Long Does Inpatient Ambien Rehab Last? Should I Stay Near Home? Are You Ready to Get Sober? Ambien is well known as a sleeping pill. Some people become addicted to Ambien as a result of using it for medication. These people often can't sleep without the drug and they also suffer physical illness if they stop taking it. Ambien addicts may or may not take the drug to get high; some people become addicted even when using it as directed. Call 1-888-341-7785 to get a referral to an Ambien rehab center for help defeating this addiction. Ambien rehabilitation programs focus on healing both the physical and psychological aspects of an addiction to this drug. Most programs allow patients to receive psychotherapy on a regular basis as well as treatment for underlying physical and mental health issues that are contributing to Ambien addiction. There are various types of Ambien treatment programs available, but all programs focus on teaching addicts to function normally without having to use Ambien. Successful graduates of these programs are able to live happier and more productive lives after treatment. If you are struggling with Ambien addiction, don't lose hope. Call 1-888-341-7785 to start the process of regaining control of your own life. Many Ambien rehabilitation programs are inpatient. This means that patients live full time at the Ambien rehab center. Usually, patients live with other people who are also recovering from drug or alcohol addiction. This can aid the recovery because participants can give one another support and help each other feel less isolated when dealing with their problems. In addition, inpatient treatment often leads to a more effective rehabilitation experience. Patients in inpatient treatment receive therapy at least once a day, and possibly more often. They also have access to therapists 24 hours a day while they are in rehab. Many rehab programs also offer intensive treatment for underlying mental or physical health issues that could be contributing to Ambien abuse. Some people prefer not to use inpatient service, however, because they feel it disrupts their life too much. They can't hold an outside job, and they'll be away from their family while in treatment. These people may prefer outpatient treatment, which allows them to live at home and visit the Ambien treatment center for therapy. Since Ambien is both physically and psychologically addictive, you may be better off going to an inpatient Ambien rehab center rather than participating in an outpatient program, at least initially. This will allow you to recover from the physical effects of withdrawing from Ambien and get some intensive treatment for your psychological addiction to the drug. Many people have more success with an inpatient treatment center. However, outpatient therapy can work for some individuals. The type of treatment that is right for you depends on your circumstances and needs. Tolerance occurs when the body gets used to the drug; the dose you usually take ceases to have the same effect. -Rehabs.com Ambien problems often begin when a patient develops a tolerance to the drug. Tolerance occurs when the body gets used to the drug; the dose you usually take ceases to have the same effect. In order to feel drowsy and fall asleep, you have to take larger quantities of the drug. Many Ambien users get into trouble when they develop tolerance because they simply take another pill rather than consulting their doctors about the problem. This can cause the person to become dependent on Ambien. Dependence occurs when the body is so used to the drug that it cannot function normally without it. Some Ambien users become psychologically dependent on Ambien as well; these users feel depressed, irritable or angry if they do not continue to take Ambien. Once a user has become dependent on Ambien, an Ambien rehab center can help him or her withdraw safely from the drug and return to a healthier existence. Some Ambien users are extremely concerned with privacy. These users may go to a far away Ambien rehab center to ensure that nobody in their hometown knows they are receiving treatment for an addiction problem. The good news is that it is invariably illegal for Ambien rehabilitation centers to violate your confidentiality. Since addiction treatment is medical in nature, Ambien rehabilitation staff can't share details of your treatment or even inform others that you attended their center. However, Ambien treatment facilities do have the right to insist you have a roommate while you attend inpatient treatment. You can usually pay extra to get a private room if you so desire. There are several standard treatment models for inpatient Ambien rehabilitation programs. The shortest programs last 28 to 30 days; there are also 60-day and 90-day programs available. Some Ambien treatment centers also offer long-term treatment. Many patients enter their Ambien treatment program tentatively; they are unsure whether the program will be right for them. For this reason, most Ambien rehab centers allow patients to initially sign up for a 30-day program and then extend their stay. Often, patients and their doctors or therapists will discuss further treatment on a regular basis and decide together how long the patient needs to stay in treatment. When you first contact an Ambien treatment center, you meet with an intake counselor. The counselor talks to you about why you want treatment and asks you questions to try to find out how long you have had a problem and if you have other problems, such as other addictions or mental health issues, that require treatment. You'll stay in the hospital for about a week so doctors can monitor your symptoms as you withdraw from Ambien. During the next 30 to 90 days, you participate in inpatient treatment. Usually, you attend therapy on a daily basis and participate in support groups. As you approach the end of your initial treatment period, you and your treatment providers discuss whether or not it is in your best interest to leave the Ambien treatment center. You may decide to stay in the Ambien rehab center for a longer period of time. Once you graduate from rehab, you will probably need to attend outpatient therapy sessions on a weekly basis for at least one year. Some people also move into a halfway house or sober living facility after rehab instead of immediately going home. This allows them to participate in their normal routines while still living with other addicts and being subject to strict rules. Ambien rehab programs are not cheap. Depending on how long your stay is, how much therapy you receive and what your other needs are, you might have to pay thousands of dollars. You also usually have to pay for your food and lodging while you are in treatment. Some health insurance companies cover Ambien rehabilitation programs. If your insurance doesn't cover this type of treatment, consider making financial arrangements with the program director. You may be able to make monthly payments or arrange some other type of special payment arrangement. Some people prefer to save money and time by attending an Ambien rehab program near where they live. It's easier to get to the program if it's nearby, and friends and family can visit often. In addition, it will be easier to come back for outpatient therapy afterwards if the Ambien rehab center is near where you live. However, people who want to ensure their privacy may prefer to attend a program far away from home. This way, nobody in their place of residence will accidentally find out that they are living at an Ambien rehabilitation center. Also, this gives patients the opportunity to focus on their recovery, away from the day-to-day distractions of their normal lives. If work-related duties are hindering you or a relative from looking for assistance for a narcotic or prescription drug issue or behavior-related addiction, executive rehab treatments will be what you need. Pairing highly-rated drug, alcohol or behavioral addiction treatments with the freedom of computer and mobile access, an executive team member can get support while staying relatively "plugged in". Often, contemporary substance addiction and behavioral treatment facilities furnish the top-shelf amenities you'd expect to enjoy only in the world's finest hotels, with your comfort and well-being being the areas of focus. 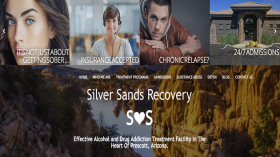 From in-house massage therapy and housekeeping services to 5-star chef-prepared meals and fine linens, you can get the best-rated drug, alcohol or behavioral addiction treatment for yourself or your relative while keeping comfortable. For support in determining excellent luxury treatment programs for Ambien addiction, dial our no-cost hotline now at 1-888-341-7785. Once you leave rehab, you need to make arrangements for your aftercare. Outpatient therapy and other treatments can help you adjust to your daily life so you don't feel the need to return to using Ambien. Usually outpatient therapy lasts at least a year; you and your therapist will decide together when it is appropriate to stop treatment. Sometimes other people push addicts to get help. While it's important to listen to their opinion, you need to want sobriety for yourself or treatment is unlikely to be effective. Think about your Ambien use and ask yourself if you want it to continue. If you don't, you are probably ready for sobriety. Call 1-888-341-7785 to get in touch with an Ambien rehab program. If the Ambien addict in your life isn't ready for sobriety, you may be interested in intervention programs. Interventions are carefully structured meetings in which friends and family express concern and strongly encourage the addict to get help. Addicts who want help but are uncomfortable with the spiritual aspects of some traditional rehab programs may be interested in reading more about alternatives to 12-step programs such as non-spiritual recovery groups. Whether you fall into these categories or not, you can get help for your Ambien addiction. It is never too late -- even if you have been using Ambien for years, treatment programs can help you turn your life around. Call 1-888-341-7785 to take the first step towards a sober, healthy and productive life. What are the street names for Ambien? Am I addicted to Ambien? If you need Ambien on a nightly basis and feel sick or strange when you don’t take it, you may be addicted. You also may be addicted if you change your dose without consulting your doctor or take the medication in a way other than it was prescribed. What are the long-term effects of Ambien abuse? There are several serious long-term effects of abusing Ambien. Long-term users may develop paranoia or delusions. They may also experience decreased libido and impaired ability to reason. They may forget how much of the drug they have already taken and take too much, which can be fatal.